my (hopefully rare) Apple II card. It is made by Practical Peripherals, and is known as a GraphiCard. 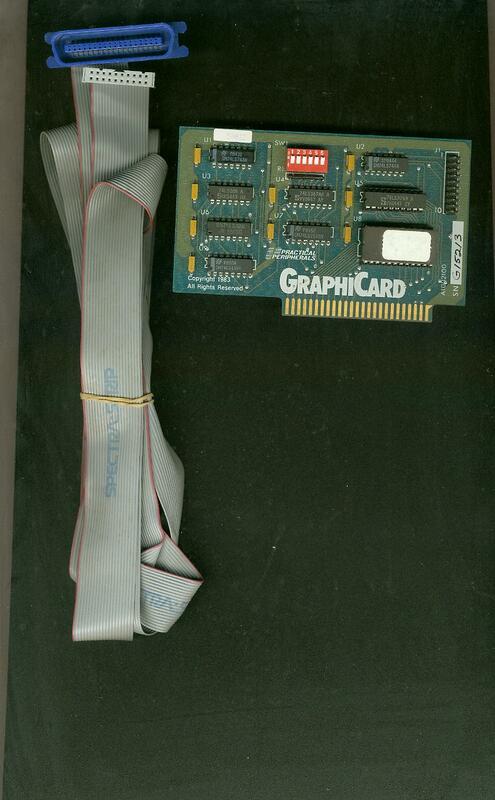 The main chip, in the bottom right hand corner reads: GRAPHICARD REV. 1.10 (c) 1984. In the bottom left, it reads: Copyright 1983 All Rights Reserved. there is a lable at top that reads "54021", and the nubers on the right side read: "A1002100; SN G15213". Note: the G15213 is hand written in ink. Also, the cable plugs into what appears to be a disk drive port on the card, but on the other end, has a blue, SCSI-like connector. Wierd. Cable is approx. 6ft long. Oh, and the red box is a set of dip switches, from 1-6.